Ocean vistas, views of tropical greenery and a prime hillside location - Villa Disa 7 certainly checks off all the right boxes. As part of the L'Orchidee Residences estate, Villa Disa 7 shares the compound with 24 other villas, but offers ultimate privacy in its standalone compound. 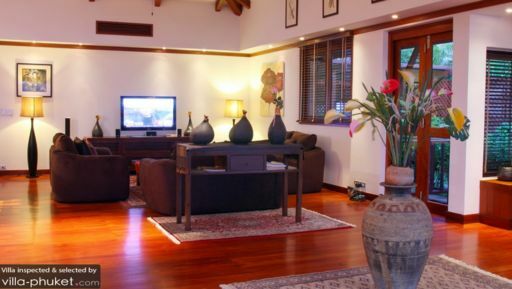 This three bedroom holiday home features a contemporary design (balanced with a touch of traditional Thai elements), comes outfitted with modern amenities and is ideally kitted out for groups of six. Of the three bedrooms, two are capacious master suites fitted with king beds, private en suites with jacuzzi tubs and sun-drenched balconies. The third is a guest bedroom with twin singles (these may be converted into a king bed upon request) and a private en suite. With all the right kinds of blues - from the clear skies to sparkling Andaman Sea - vacationers will never tire of the scenery at Villa Disa 7. The best spot to soak up the tropical vibes is the glistening infinity pool; hugging close to the edge of the property, it offers uninterrupted panoramas of the ocean. By the poolside is a pavilion; outfitted with lounge furniture and a dining set, this is focal point for al fresco meals, social gatherings and shaded siestas. Guests also share access to the estate’s common amenities, which includes a pool, children’s pool, pétanque pitch, pool table, fitness centre with sauna and a convenience store. Living spaces at Villa Disa 7 are spread out across two storeys; the first level houses the bedrooms, while the upper floor features the communal areas. The villa boasts a refreshing modern décor complete with a simple colour scheme, wood-clad interiors and contemporary furnishings. 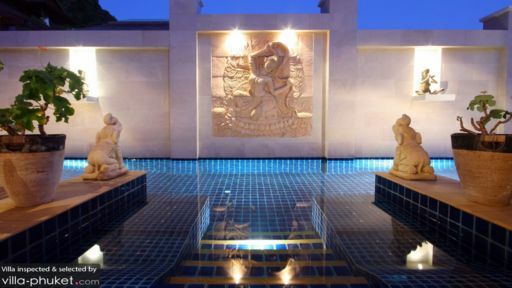 Yet, it stays true to its oriental roots with traditional elements like a Lanna-style roof and Thai art works. Bi-folding glass doors framing the space are easily pulled back, so you can create an indoor-outdoor area that brings the stunning coastal landscape in. Set in an open plan layout, the indoor lounge, kitchen and dining area flow seamlessly into one another. Plush sofas encircle a wooden table and 42-inch plasma TV in the lounge, an elegant dark wood dining set seats eight and the open kitchen is outfitted with a full range of cooking amenities. Guests at Villa Disa 7 enjoy impeccable service from an on-site team. Airport transfers, daily housekeeping and guest services are included. Services available at additional cost include: dedicated in-villa staff and private chef services, in-villa massage treatments, vehicle rental, private driver services, child minding services and grocery shopping services. A free shuttle bus service that runs between your villa and the estate entrance is available for use. With its vibrant nightlife and dining scene, variety of travel attractions and lively beach atmosphere, it’s unsurprising that Patong is the island’s tourist hotspot. But the vibes isn’t always raucous and rowdy - in fact, the town is becoming increasingly family-friendly with the addition of amenities like sprawling shopping complexes, kids’ clubs and adventure parks. Patong Beach, located 10 minutes’ walk from your villa is a vacationer’s favourite. Sunseekers flock here in droves, so you’ll easily rub shoulders with a diverse crowd of travellers. With cafes, bars and restaurants line the crescent shape beach, you’re never lacking in choices for seafront dinners or watering holes. Away from the beach, there’s luxury spa treatments, Thai cooking classes, shopping and outdoor adventures. Places that come with our recommendations include: Aqua Spa (at Avista Hideaway), Pum’s Cooking School, Jungceylon Shopping Centre, the Flying Hanuman and Phuket Wake Park. Patong’s diverse dining scene throws out a wide-ranging variety to suit different palates. You’re bound to find a suitable spot, whether you’re craving Thai, fusion or Italian. Need recommendations? Our to-go venues include: La Gritta, Lim’s Restaurant, Le Versace and Wassa Homemade Bar. This was my first time in a villa and i was definitely not disappointed! the Villa was absolutely stunning with views of the whole patong beach, we could've easily just stayed and relaxed in the villa the whole trip. The staff were really friendly and helpful when we needed to book out trip to phi phi island and to see fantasea. 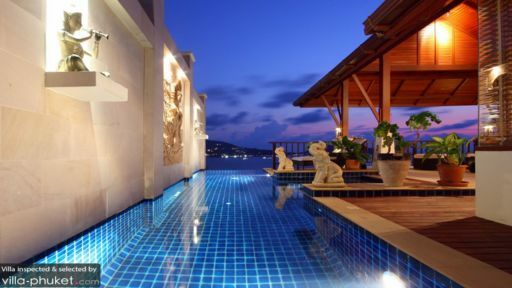 I would definitely highly recommend anyone who is going to phuket to think about taking up one of these villas. you will definitely not be disappointed. The trip up to the villa is very steep but luckily they have a tuk tuk running 24/7 to take you up to the villa, so everything is thought of for the customer's comfort! I would definitely stay with them again when we go back!